Did you know that 94% of Fortune 500 companies are testing or deploying iPads — and that’s just iPads. These organizations are doing incredible things with tablets in the areas of sales enablement, training, mobile access to operating procedures, documentation and much more. Companies are also integrating tablets and smartphones into customer communications to drive deeper customer engagement and brand loyalty. Organizations of all sizes are realizing the increasingly important role digital and mobile plays in connecting employees, partners and customers. To communicate with employees and customers around the world, Lufthansa Cargo needed to develop a corporate tablet and smartphone app that featured key details about the company such as information on its fleet, network, infrastructure, products and corporate responsibility. 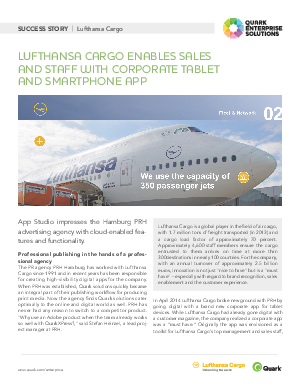 While Lufthansa Cargo had already gone digital with a customer magazine, the company realized a corporate app was a must have. Originally the app was envisioned as a toolkit for Lufthansa Cargo‘s top management and sales staff, but it ultimately developed into a multimedia offering for all air cargo enthusiasts. Download the case study to learn how Lufthansa Cargo increased its digital reach with an award-winning corporate app.